The study of physics is the study of some of creation’s most inscrutable mysteries. Scripture tells us we are “fearfully and wonderfully” made. And few know that better than a physicist! Here you’ll study the laws of physics with a high regard for the creation’s God-given wonder, complexity, and amazing power. 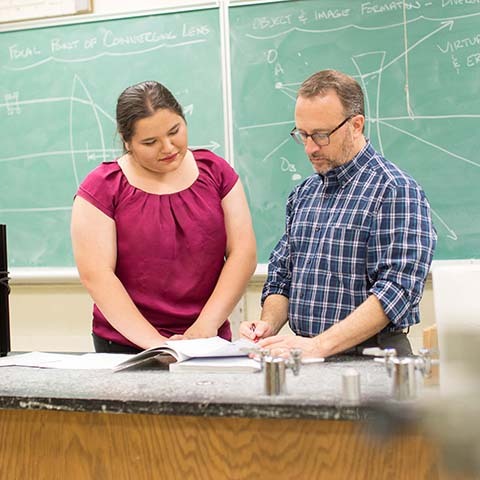 Led by a nationally recognized physicist who maintains a research program at the university, our Department of Physics offers degrees that can launch you into engineering, biomedical physics, teaching and a range of other scientific and technical professions. Through the years, the department’s reputation for graduating well-prepared students has been — anything but theoretical. So chances are you already know something of string theory, game theory, condensed matter, particle attractions and more. It’s the “and more” we have ready and waiting for you. The influence of science and technology touches almost everyone every day in every part of the world. The Department of Physics is dedicated to providing a variety of engineering and physics curricula for students who are interested in pursuing scientific and technical professions. The specific curricula available in the Department of Physics are the major programs in Biomedical Physics, Physics and Physics Teaching, and the minor programs in Biomedical Physics and Physics. Research opportunities abound for undergraduates from many different academic areas working with faculty in the department of physics. Department faculty have expertise in condensed matter physics, nuclear and particle physics, and biomedical physics. Recent graduates of the department have gone on to such prestigious graduate programs as Harvard, Columbia and Vanderbilt as well as to lucrative employment opportunities. Professor L. Alan Bradshaw was awarded the Nightingale Prize for the Best Paper published in Medical & Biological Engineering & Computing in 2005. Professor Bradshaw maintains an active research program at Vanderbilt University investigating gastrointestinal biomagnetic fields that has also involved numerous Lipscomb undergraduates. The Department of Physics utilizes four laboratories for instruction in the McFarland Hall of Science, as well as a machine shop, electronics shop, and x-ray laboratory. In addition, the department shares access to the computer classrooms in McFarland, which provides a number of typical student stations, as well as several stations for special applications. The computer classrooms are connected to the campus-wide network and have access to a substantial library of software applications. Here are some helpful resources to aid you in your physics education while at Lipscomb. As medicine and biology advance, so does physics. So let us prepare you with chances to join in research and laboratory opportunities alongside of our seasoned faculty to develop a firm foundation in physics, chemistry and biology. Study some of the physical world’s most inscrutable mysteries and examine the laws of motion and energy inherent in everything we do. Investigate the principles of physics with a high regard for creation’s God-given wonder, complexity, and amazing power.